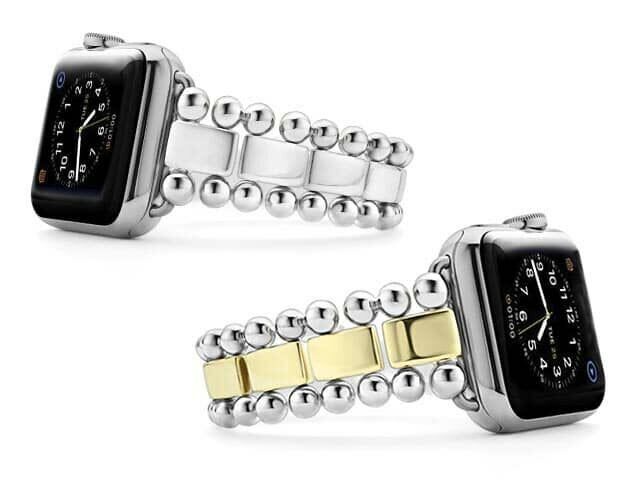 NEWS – Forget about plastic, leather, or stainless steel bands – these Apple Watch bands from LAGOS are firmly pegged at the “fine jewelry” end of the spectrum. The Smart Caviar bands are made of sterling silver, 18K gold, and diamonds. Steven Lagos, the founder and Creative Director of LAGOS, says: “I’m a big fan of the Apple Watch® and love the functionality. It is perfectly designed for the sporty lifestyle but something was missing – there was no fine jewelry element to it.” He wanted to create a way to turn the sporty Watch into a jewelry Watch, and these Smart Caviar bands are undoubtedly a beautiful way to do so. The Smart Caviar bands are available in four unisex styles. 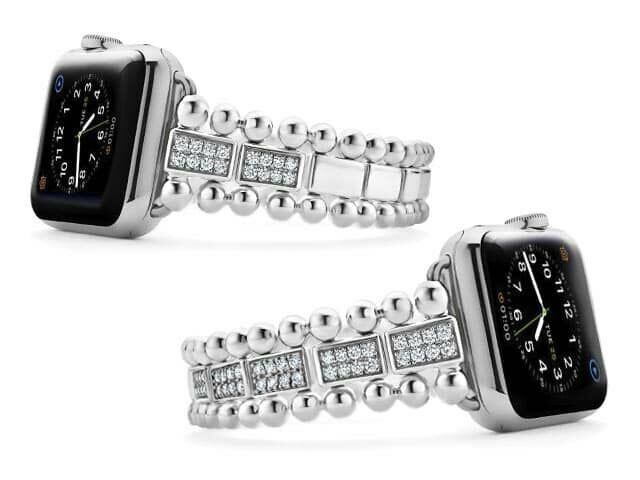 The sterling Smart Caviar band is $950, and the sterling/18K two-tone band is $3500. The partial diamond Smart Caviar band had 1.20 carats of diamonds and is $5000; the full-diamond band with 2.48 carats is $8500. All four styles accommodate both the 38mm and 42mm Apple Watch (Series 1, Series 2, and Series 3), and all come with a sizing tool and one extra link to ensure a comfortable fit. Additional links, if needed, may be purchased for $80 – $700 each, depending on the materials. The LAGOS Smart Caviar bracelets are available exclusively at Bloomingdales (online and in-store). Learn more at Bloomingdales at the above links or at the LAGOS website. Since the new Series 4 still takes the same bands, if one were planning to get their $$$$ Hermes model this with a standard model might actually make more sense lest they be left behind like the folks who paid big $$$ for the 1st generation bling one. 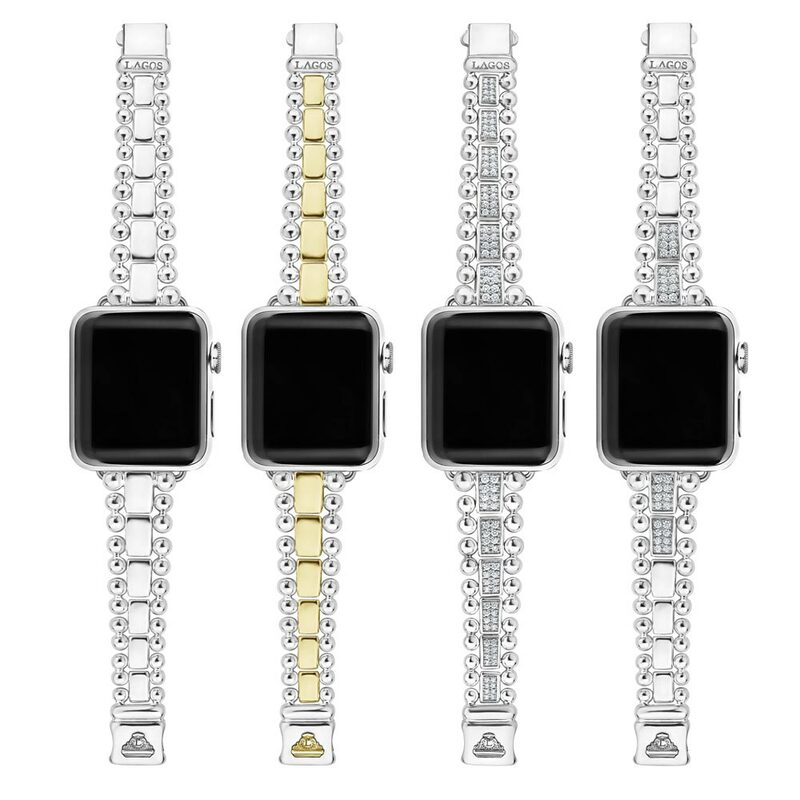 When will the Lagos Apple Watch band be available thru Nordstrom’s?